For roasteries, data collection can improve profits, efficiency, quality, and more. 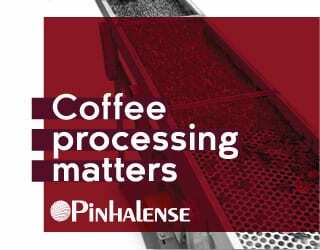 And with decreasing computer and data acquisition hardware costs, and the increasing amount of software specialized for coffee roasting operations, it’s easier than ever to collect it. Whether it’s sourcing, product development, production, quality assurance, or sales, the data is available – but that does not guarantee that it will be useful. 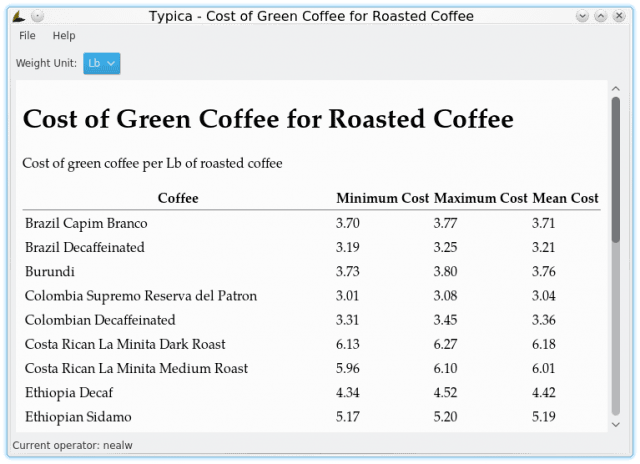 I’m the author of Typica, a free, open-source application (recently updated to version 1.8) for coffee roasters and roasteries that offers everything from data collection to batch tag printing. Here is my advice on what data coffee roasteries should collect, what data collection methods to use, and how to evaluate data efficacy. Typica 1.8 screenshot. The cost of green beans per pound of roasted coffee. The variation is due to differences in % weight loss across batches roasted. What Data Can You Collect? There are four broad categories of data that are useful for roasting operations: roast, production, lab, and sales. This includes temperature measurements over time, control changes performed, and the amount of time it takes for temperature to pass through relevant temperature ranges. It also refers to data that can be calculated from these, such as rate of change or the difference between measurements taken in different parts of the roaster. Other sensor data – such as color, air pressure, or velocity – can also be recorded, if your equipment has that option. This includes information on green coffee purchases, as well as details like who roasted a batch, when it was roasted, how much of a particular green coffee was used, and how much of a particular roasted coffee was produced. This deals with any kind of analysis performed on the green, roasted, or finished product. That can include: cupping forms, green grading forms, physical measurements such as moisture content, bulk density, color, ground particle size distribution, triangulation cuppings, comparisons of brewed coffee against a sensory specification, and more. Who buys what? How often are purchases made? Is there some kind of promotion or event happening that might skew sales? Roaster retailers should also consider coffees used at the bar. Before we take an in-depth look at these four types of data, let’s quickly discuss how you can record them. Paper forms, single-purpose apps, and multifaceted data systems are all possibilities with distinct advantages and trade-offs. Paper forms can be easily customized to your specific needs and can make data collection very efficient. However, using that data later often involves copying the information onto a computer – a boring and error-prone task. It is also important to adequately consider the different ways you might want to filter and aggregate the records prior to data collection. If you don’t do this, it could be difficult to perform specific analyses. Single-purpose utilities, such as cupping apps, simple roast profile loggers, and point of sale terminals can replace paper records. They can also make it easier to get this data in a usable form, but often they are not designed to integrate with systems outside of their area of focus. This makes it challenging to combine data from different applications. As a result, you may need to enter the same information into multiple systems. Programs that integrate data from multiple tasks can solve these challenges. However, they can present their own challenges if you don’t require the full range of features offered. They are also often more complicated to use than other options. Roasted coffee, ready to cool down. 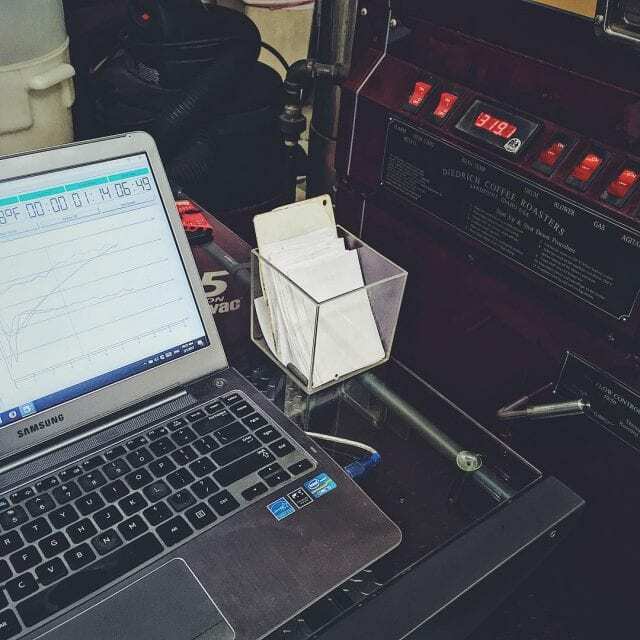 Using a computer for data collection, rather than recording it manually, is one of the easiest and most significant improvements that can be made in a roasting operation. In the US, basic data acquisition hardware can be installed in most machines for about $100, although more specialized options or automation systems will be more expensive. Even without automation, however, this allows people to focus more on roasting and less on documenting the roast. 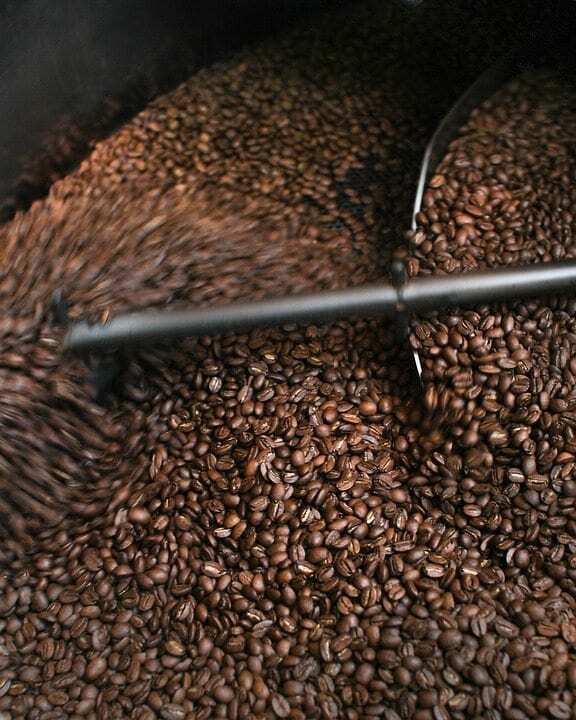 Computers can display a current batch against an appropriate roasting plan, perform real-time rate of change calculations, make calibration adjustments for different machines, and isolate more significant portions of the roast. This can all result in measurable improvements in production consistency – especially for less experienced staff. 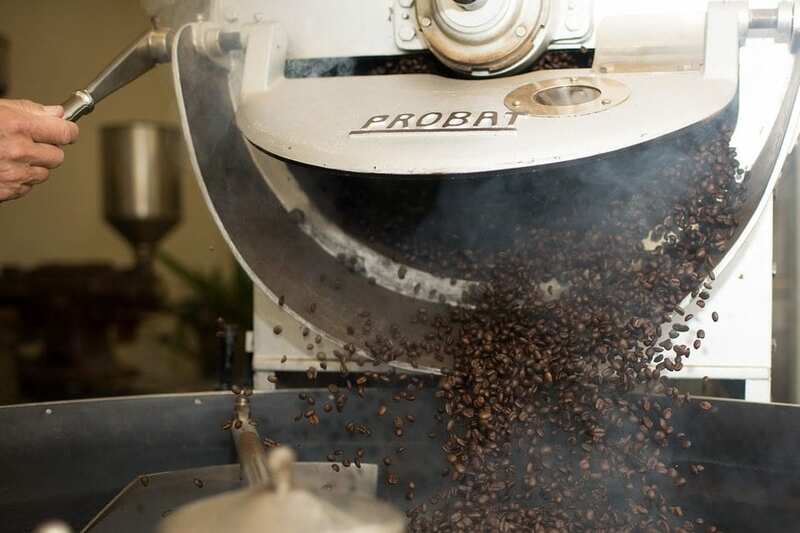 Several software options exist, and some of these make it easy to connect roast data to inventory tracking, production metrics, and quality assurance processes. Typica 1.8 screenshot. 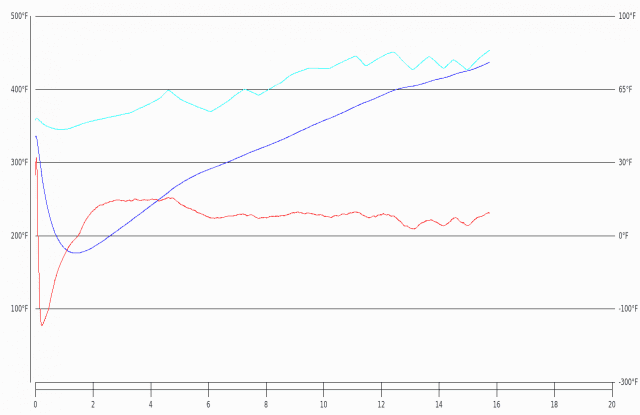 Line graph showing air, bean, and rate of change of bean temperature. One challenge facing specialty coffee roasters is how to balance production efficiency with product freshness. 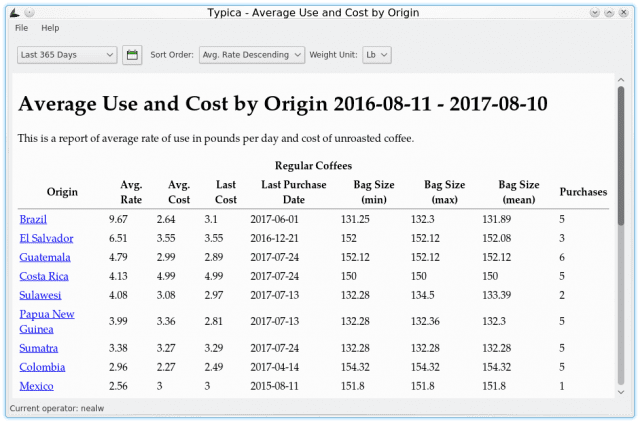 Tracking production data makes it easier to decide on optimal batch sizes based on current and recent demand for each coffee. Variation in percent weight loss can help identify which batches might deserve extra scrutiny in quality assurance or who might benefit from additional training. 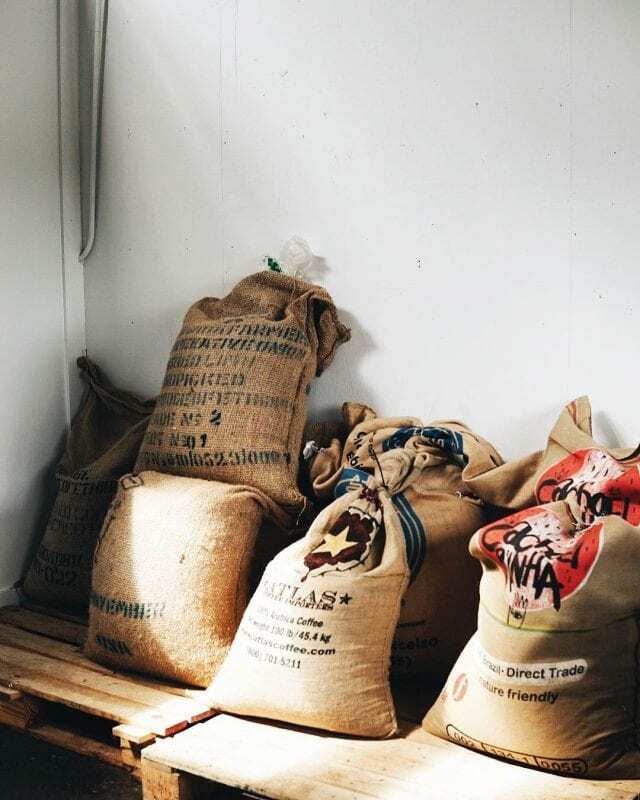 Additionally, if a coffee is roasted in multiple ways or used in blends, understanding demand from these different products is useful for creating purchasing plans. Storing this information in a database enables a wide range of reports and projections. It can also simplify audits that might be required by third party certifications. Typica 1.8 screenshot. Average daily use (in pounds) and cost by coffee origin. The physical properties of a coffee influence how that coffee behaves in the roaster. As of such, they may suggest different approaches to roasting that coffee. They might also indicate supply chain issues that can influence a purchasing decision. Post-roast analysis is key to ensuring that the coffee matches your intentions, as well as diagnosing the cause of any variations or failures. Remember that green coffee storage conditions or duration can require roasting or blend adjustments over time. Grind quality affects extraction in brewing. Packaging equipment can fail in ways that compromise packaging integrity. Regularly testing finished products and comparing test results over time makes it possible to correct problems before they reach a customer. Typica 1.8 screenshot. Average cup scores from one cupping session grouped by sample, with the highest-scoring sample highlighted. A baseline understanding of what your customers are buying means you can observe trends due to demographic shifts and seasonal variations. It also allows you to measure the impact of changes to a product line, different events, and promotions. In turn, this makes it easier to make product line adjustments over time, plan promotions and events to improve sales, and build realistic contingency into purchasing plans – something that will help you lessen the impact of events outside of your control, such as port delays, without over-committing on any of the coffees you purchase. It’s important to base data collection decisions, from tools to categories, on how you intend to use the data. Using a form designed for evaluating green coffee quality isn’t going to be a good fit for documenting roast plan design or measuring production consistency. If you’re considering tailoring your production processes to what a particular piece of software makes easy, it might make more sense to find a different program or design a new form. Customizing systems for your needs is also a possibility. Some commercial offerings have customizations options and there are also open source applications available which can be modified as needed. If you lack the technical skills to customize them, it is possible to pay a developer to work with you to create the system you need from tools that already exist. Periodically review your data collection methods and use. As your business grows, you’ll face different challenges that may require different information. Technology changes may enable approaches that were previously cost-prohibitive. It’s also possible that data that seemed like a good idea to collect has not been as useful as you hoped. If the data isn’t useful, or if it strongly correlates with something that’s easier to measure, you may want to stop collecting it. Overly burdensome data collection is unlikely to be performed with the accuracy and consistency needed to obtain useful insights. Remember that all of this data collection and analysis is useful only to the extent that it provides genuine operational benefits. Effective data practices should result in improvements to operational efficiency, production consistency, cash flow, and sales, while also making purchasing and production easier to plan. What’s more, integrating data entry and analysis into tasks should be done in a way that makes the work easier to do correctly. Data collection is a valuable tool – providing you use it well. Written by Neal Wilson, Founder of Wilson’s Coffee & Tea and Author of Typica, a free and open source application for coffee roasting operations.